A few weeks ago I successfully managed to build Mixxx 2.x on a Raspberry Pi 3. Once I got that done I immediately identified “more than enough” (that is: one) situations where it would be great to have yet a smaller piece of hardware to run Mixxx on (placing a link. Just in case you might not already know what we’re talking about). That’s why I think running Mixxx on a Raspberry PI Zero ist the next logical consequence. I once (and only once) managed to successfully build the latest branch on a Pi Zero (2.3.0 alpha pre, as of time of this writing) but was not able to reproduce it. Good thing: After some tedious trial-and-error I finally found a way to reliably build Mixxx 2.2 for (and on!) a Raspberry Pi Zero. 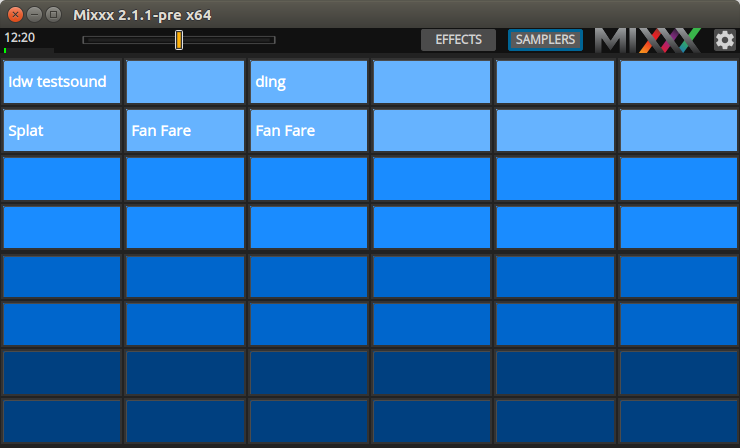 I wanted to build a sample-player (“soundboard”) and decided to use Mixxx because it has all the necessary features that I was looking for (open source, runs on a Raspberry, highly customizable, …). My target scenario for this installation is to use it together with a Midi-controller and the official 7″ touchscreen for Raspberry Pi. While Mixxx comes with a set of skins (i.e. user interfaces) with focus on different aspects all of them have in common that they are providing all the functionalities for DJ’ing: 2 or 4 decks for playing tracks, crossfader, mixer-section, library, etc. Many of these things can be hidden from the screen but even then there are still too many things left visible consuming precious real-screen-estate. While every skin provides the functionality to hide the mixer section or the sampler there is (technically) no way to completely hide the decks via temporary selection. They seem to be seen as an integral part of every Mixxx-skin. That made it necessary to do some serious work on this. Since building a skin from scratch was completely out of reach I took the skin “Deere (64 Samplers)” as a starting point and worked my way up from there. Fortunately, before starting a new project myself I came across Mixxx. It’s an open source DJ-Software with a completely customizable user-interface that also includes a multi-cell sample-player. Mixxx version 1.10 is readily available for various platforms (“sudo apt-gt install mixxx” on a Raspberry PI) but has been superseded by version 2.1.1 (as time of writing). There are no precompiled binaries for Mixxx 2.1 on a Raspberry PI yet so the first step was to build a version myself. The necessary steps are documented in Mixxx’s own Wiki but it’s partially outdated and not everything is located in one place.